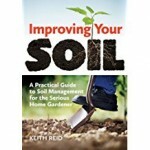 Good soil is basic to any garden and Keith Reid’s book, Improving Your Soil, is a comprehensive guide for learning how to create the best soil for your plants. Written for gardeners with either small or medium sized gardens, the author covers wide variety topics that will help gardeners optimize their soil so they can produce plants with bigger vegetables and more flowers. With the aim of demystifying soil and offering practical methods for growing better plants, Reid draws on his love for soil and his long experience as a soil scientist to write a well written, easy to read guide for soil improvement. Reid begins by detailing all the many changes that occur in soil over the year by season and thereby makes the reader aware of the dynamic nature of soil. He goes on to describe the steps necessary to determine the type of soil, the challenges of different kinds of soil, and the importance of soil texture and structure to good plant growth. Reid explains the role of water in soil management offers suggestions for improving the availability of water to plants, and provides multiple irrigation strategies. A discussion of the role of soil pH, availability of nutrients to plants, and the organic components of soil lead to a discussion of how biological cycles can be used to benefit the soil, affective ways to apply nutrients, and suggestions for responsible stewardship of the soil. Appendices with lists of laboratories that test garden soil, and agricultural and horticultural extension resources conclude the work. The focus of the book is how to work with the soil you have to make it the best it can be and thus have a more productive garden. The author is careful to explain the reasons behind his suggestion which I find especially helpful and significant. He has taken a subject that does not usually inspire a reader to greatness and made it approachable, doable, and appealing. If you recognize the huge importance of soil to growing plants but are stymied by the prospect of creating good soil, this is an excellent resource. To buy Improving Your Soil from Amazon.com Click Here.